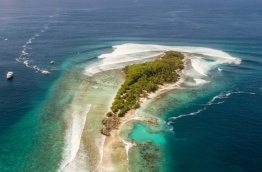 A young man passed away while being treated after drowning when he surfing at popular surf point Thanburudhoo in Kaafu atoll Saturday. According to Maldives National Defense Force (MNDF), Abdullah Naail, 21 was found near the shore on the eastern side of the island after being reported missing. MNDF reported that he was immediately given medical aid at the island, and was taken to Male for further treatment Saturday evening. Coast Guard received reports of Naail going missing around 17:00. He had reportedly gone surfing an hour before.